Epididymitis (inflammation of the epididymis; see the image below) is a significant cause of morbidity and is the fifth most common urologic diagnosis in men aged 18-50 years. Epididymitis must be differentiated from testicular torsion, which is a true urologic emergency. Although epididymitis may often be an infectious process, cultures commonly fail to demonstrate any identifiable infection. Go to Acute Epididymitis for complete information on emergent management of epididymitis. With regard to the last item above, true local pain can be distinguished from referred pain by spermatic cord injection with 1% lidocaine. Refractory pain that is not improved by analgesics has also been managed by denervation of the spermatic cord. With regard to fertility problems, sterility is uncommon after acute epididymitis, although the true incidence is unknown. Disturbances in the sperm quality secondary to leukocytospermia and inflammation are usually transient. More important is the far less common azoospermia, which is caused by the epididymal duct obstruction observed in men with untreated or improperly treated epididymitis. The incidence of this condition is unknown. The patient should limit activity, and the scrotum should be immobilized. Stress that the course of antibiotics needs to be completed, and also stress the need for screening tests for and treatment of comorbid sexually transmitted diseases for the patient and his sexual partners. For patient education information, see the Men's Health Center, the Infections Center, and the Sexual Health Center, as well as Epididymitis, Inflammation of the Testicle (Orchitis), Mumps, and Sexually Transmitted Diseases (STDs). The image below is a diagram of the testis and epididymis. The exact etiology of acute epididymitis is unclear; however, it is believed to be caused by the retrograde passage of urine from the prostatic urethra to the epididymis via the ejaculatory ducts and vas deferens. Obstruction of the prostate or urethra and congenital anomalies create a predisposition for reflux. Normally, the oblique angle of the ejaculatory ducts through the dense prostatic tissue prevents reflux. Fifty-six percent of men older than 60 years who have epididymitis exhibit concurrent bladder outlet obstruction (BOO), such as a urethral stricture or benign prostatic hyperplasia (BPH). Reflux may also be induced by Valsalva maneuvers or strenuous exertion. This can be seen in athletes such as weight lifters. Epididymitis is commonly found to develop during strenuous exertion in conjunction with a full bladder. Instrumentation and indwelling catheters are common risk factors for acute epididymitis. Epididymitis may be accompanied by urethritis or prostatitis. Infection that is severe and extends to the adjacent testicle is termed acute epididymo-orchitis. The etiology of acute epididymo-orchitis varies with the age of the patient and may be a bacterial, nonbacterial infectious, noninfectious, or idiopathic process. Tuberculous epididymitis can occur in endemic areas and is still the most common form of urogenital tuberculosis (TB). It is believed to spread hematogenously and often involves the kidneys. Epididymo-orchitis may develop following bacillus Calmette-Guérin (BCG) treatment for superficial bladder cancer (at a rate of 0.4%). Viral epididymitis is thought to be the predominant etiology of pediatric epididymitis. It is defined by the absence of pyuria. Although mumps is the most common viral cause of epididymitis, coxsackievirus A, varicella, and echoviral infections have also been identified. Other rare infections (eg, brucellosis,  coccidioidomycosis, blastomycosis, cytomegalovirus [CMV], candidiasis, CMV in human immunodeficiency virus [HIV] infection, nontuberculous mycobacteria) have been implicated in epididymitis but usually occur in immunocompromised hosts. Roughly 1 in 1000 men who undergo vasectomy describe a postvasectomy pain syndrome of chronic, dull, aching pain in the epididymis and testicle. The pain is most likely secondary to chronic epididymal congestion of sperm and fluid that continues to be produced after the vasectomy. The epididymis can become distended from back pressure of this fluid, particularly following the close-ended vasectomy technique. When sperm extravasates from the end of the vas deferens, such as can occur in the open-ended vasectomy technique, a sperm granuloma may develop, with a resulting inflammatory reaction. Men older than 40 years may have BOO (eg, BPH) or a urogenital malformation that predisposes them to urethrovasal reflux and the development of epididymitis. Such reflux can also be induced iatrogenically after certain surgical procedures, such as transurethral resection of the ejaculatory ducts, resulting in epididymitis. It can also be a result of heavy physical activity such as weight lifting. Acute epididymo-orchitis has been described in 12-19% of individuals with Behçet syndrome. It is also associated with Henoch-Schönlein purpura in the pediatric population, most likely as part of a systemic inflammatory process. Up to 38% of patients with Henoch-Schönlein have scrotal involvement (range, 2-38%). Amiodarone epididymitis is secondary to high drug concentrations, usually in the head of the epididymis, and can occur in up to 3-11% of patients taking the drug. This is a dose-dependent phenomenon and typically occurs at dosages greater than 200 mg daily. Epididymal levels of the drug are up to 300 times those of the serum, resulting in antiamiodarone HCl antibodies that subsequently attack the epididymis, resulting in the symptoms of epididymitis. Histologic analysis reveals focal fibrosis and lymphocytic infiltration of epididymal tissues. Sarcoidosis affects the genitourinary system in up to 5% of cases, typically presenting with epididymal nodules. Trauma to the scrotum can also be a precipitating event, while some cases are idiopathic. With regard to a viral etiology, roughly one third of postpubertal boys with mumps have concomitant orchitis. Coxsackievirus type A, varicella, and echoviral, adenoviral, enteroviral, influenzal, and parainfluenzal infections are rare. An estimated 1 in 1000 men develop epididymitis annually, and acute epididymitis accounts for more than 600,000 medical visits per year in the United States. Epididymitis is the most common cause of intrascrotal inflammation. Incidence is less than 1 case in 1,000 males per year. However, chronic epididymitis may account for up to 80% of patients presenting with scrotal pain in the outpatient setting. Epididymitis is the fifth most common urologic diagnosis in men ages 18-50 years. The average age of a patient with chronic epididymitis is 49 years. Patients often experience symptoms for 5 years before diagnosis. Acute epididymitis most commonly occurs in men aged 20-59 years (43% in men aged 20-39 y and 29% in men aged 40-59 y). Childhood (prepubertal) epididymitis is rare; testicular torsion is more common in this age group. Structural urologic abnormalities are common in children and in men older than 40 years with acute epididymitis. Adults usually have BOO or urethral stricture or may have had previous urologic surgery on their urethra, altering their anatomy and predisposing them to infection. Children may have urethral abnormalities, such as a prostatic utricle, urethral duplication, posterior urethral valves, or urethrorectal fistula, or other anomalies, such as an ectopic ureter, ectopic vas deferens, detrusor sphincter dyssynergia, or vesicoureteral reflux. Mumps orchitis occurs in 20-40% of postpubertal boys with mumps but is rare in prepubertal boys. Pain improves within 1-3 days, but induration may take several weeks or months to resolve. Infection of the epididymis can lead to the formation of an epididymal abscess. In addition, progression of the infection can lead to involvement of the testicle, causing epididymo-orchitis or a testicular abscess. Sepsis is a potential consequence of severe infection. Bilateral epididymitis may result in sterility due to occlusion of the ductules from peritubular fibrosis. Patients with epididymitis secondary to a sexually transmitted disease have 2-5 times the risk of acquiring and transmitting HIV. All sexual partners of patients with epididymitis secondary to a sexually transmitted disease need referral to ensure that they receive adequate testing and treatment. [Guideline] 2015 Sexually Transmitted Diseases Treatment Guidelines: Epididymitis. Centers for Disease Control and Prevention. Available at http://www.cdc.gov/std/tg2015/epididymitis.htm. Accessed: December 15, 2017. Raveenthiran V, Sam CJ. Epididymo-orchitis complicating anorectal malformations: collective review of 41 cases. J Urol. 2011 Oct. 186(4):1467-72. [Medline]. Lorenzo L, Rogel R, Sanchez-Gonzalez JV, Perez-Ardavin J, Moreno E, Lujan S, et al. Evaluation of Adult Acute Scrotum in the Emergency Room: Clinical Characteristics, Diagnosis, Management, and Costs. Urology. 2016 Aug. 94:36-41. [Medline]. Siegel A, Snyder H, Duckett JW. Epididymitis in infants and boys: underlying urogenital anomalies and efficacy of imaging modalities. J Urol. 1987 Oct. 138(4 Pt 2):1100-3. [Medline]. Hongo H, Kikuchi E, Matsumoto K, Yazawa S, Kanao K, Kosaka T, et al. Novel algorithm for management of acute epididymitis. Int J Urol. 2016 Oct 6. [Medline]. Nusbaum MR, Wallace RR, Slatt LM, Kondrad EC. Sexually transmitted infections and increased risk of co-infection with human immunodeficiency virus. J Am Osteopath Assoc. 2004 Dec. 104 (12):527-35. [Medline]. Viswaroop BS, Kekre N, Gopalakrishnan G. Isolated tuberculous epididymitis: a review of forty cases. J Postgrad Med. 2005 Apr-Jun. 51(2):109-11, discussion 111. [Medline]. Nason GJ, Tareen F, McLoughlin D, McDowell D, Cianci F, Mortell A. Scrotal exploration for acute scrotal pain: A 10-year experience in two tertiary referral paediatric units. Scand J Urol. 2013 Jan 3. [Medline]. Rizvi SA, Ahmad I, Siddiqui MA, Zaheer S, Ahmad K. Role of color Doppler ultrasonography in evaluation of scrotal swellings: pattern of disease in 120 patients with review of literature. Urol J. 2011. 8(1):60-5. [Medline]. Yu KJ, Wang TM, Chen HW, Wang HH. The dilemma in the diagnosis of acute scrotum: clinical clues for differentiating between testicular torsion and epididymo-orchitis. Chang Gung Med J. 2012 Jan-Feb. 35(1):38-45. [Medline]. Waldert M, Klatte T, Schmidbauer J, Remzi M, Lackner J, Marberger M. Color Doppler sonography reliably identifies testicular torsion in boys. Urology. 2010 May. 75(5):1170-4. [Medline]. Yusuf G, Sellars ME, Kooiman GG, Diaz-Cano S, Sidhu PS. Global testicular infarction in the presence of epididymitis: clinical features, appearances on grayscale, color Doppler, and contrast-enhanced sonography, and histologic correlation. J Ultrasound Med. 2013 Jan. 32(1):175-80. [Medline]. Fehily SR, Trubiano JA, McLean C, Teoh BW, Grummet JP, Cherry CL, et al. Testicular loss following bacterial epididymo-orchitis: Case report and literature review. Can Urol Assoc J. 2015 Mar-Apr. 9 (3-4):E148-51. [Medline]. [Full Text]. Siu W, Ohl DA, Schuster TG. Long-term follow-up after epididymectomy for chronic epididymal pain. Urology. 2007 Aug. 70(2):333-5; discussion 335-6. [Medline]. Chung JH, Moon HS, Choi HY, et al. Inhibition of Adhesion and Fibrosis Improves the Outcome of Epididymectomy as a Treatment for Chronic Epididymitis: a multicenter, randomized, controlled, single blind study. J Urol. 2012 Dec 3. [Medline]. Lee JY, Lee TY, Park HY, Choi HY, Yoo TK, Moon HS. Efficacy of epididymectomy in treatment of chronic epididymal pain: a comparison of patients with and without a history of vasectomy. Urology. 2011 Jan. 77(1):177-82. [Medline]. Erdem H, Elaldi N, Ak O, Gulsun S, Tekin R, et al. Genitourinary brucellosis: results of a multicentric study. Clin Microbiol Infect. 2014 Nov. 20 (11):O847-53. [Medline]. [Full Text]. Scrotal sonogram demonstrating the presence of a hydrocele and an enlarged epididymis in a patient with epididymitis. 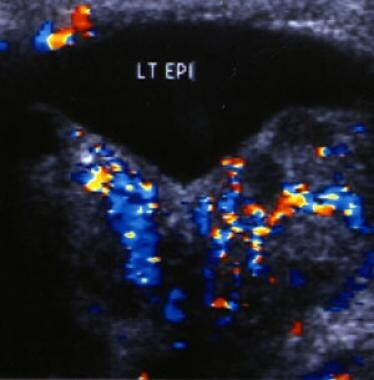 The echogenic white area is the normal testicle surrounded by the hydrocele. The authors and editors of Medscape Reference gratefully acknowledge the contributions of previous authors Michael Franks, MD, and Badrinath R Konety, MD, to the development and writing of the source article.